The Backscatter flip-up color correction filter for Hero2 has received international acclaim for excellence in image quality and ease of use. An ultra thin anodized aluminum mount allows users to quickly add or remove the filter for land and water use. GoPro Hero2 Underwater Video - Joel-Penner from Digital Shootout on Vimeo. GoPro - Magic Filter (underwater color filter) Test from EunJae Im on Vimeo. GoPro has released a flat lens housing for diving. Backscatter is pleased to announce a custom flip-up color correction filter (Magic Filter) for the new GoPro Dive Housing. The Backscatter flip filter offers an ultra thin anodized aluminum mount that allows users to quickly add or remove the filter for land and water use or as color drops off with depth. The housing adapter locks securely in place without modifications to the stock GoPro Dive Housing, is easily installed by the user, and does not vignette in any shooting mode. This filter is made to only work with the GoPro Dive Housing. The Auto-Magic allows you to take colorful underwater video/pictures without the hassle and difficulty of getting good results with the external light. It delivers great colours without the risk of backscatter. The External mounting Auto-Magic filter is the 3mm thick acryllic version of the Auto-Magic filter, which can be mounted externally on your Backscatter Custom GoPro housing. This filter can be flipped up and out of the way during a dive. This Auto-Magic filter was designed for the GoPro Dive Housing and cameras. The external mounting filter is available in a metal clamp that allows you to easily attach the filter without vigenetting. The fact that this filter is designed to work without manual white balance makes it highly suited for use with cameras without this feature (note that the GoPro needs a specialist housing to focus underwater). In short, the Auto-Magic delivers great colors without the risk of backscatter. 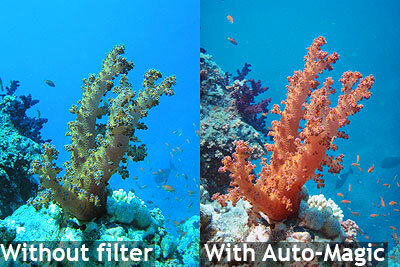 The Auto-Magic filter works particularly well with wide angle accessory lenses, for scenic and diver photography. The filter is designed for relatively shallow diving in sunny tropical conditions. On Auto white balance it works best between 3m and 10-12m (9-35/40ft) depending on the camera. Deeper than this depth the colors in the images begin to slowly fade back to a natural blue look. It is less suited to fast moving fish, which may blur.